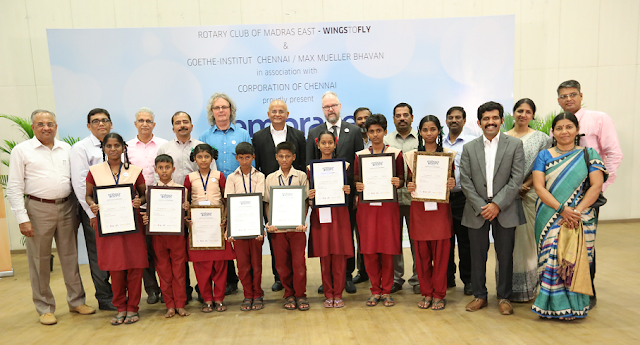 The Rotary Club of Madras East in association with Goethe Institut and Greater Chennai Corporation organized the second edition of “Wings to Fly”- Elocution Competition, exclusively for Corporation School Students of standards 6,7,8,9 and 11. 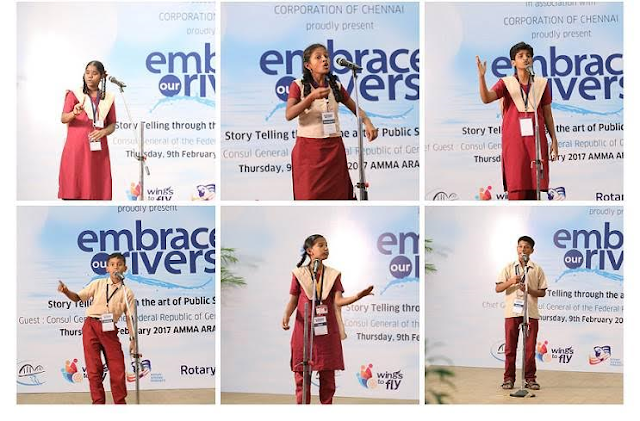 The finals happened on 9th February at Amma Arangam, Anna Nagar. The grand finale witnessed a flurry of activities and rousing speeches for winning the coveted educational trip. Mr. Helmut Schippert, Director, Goethe-Institut, Rtn. K. Ananth, President, Rtn. Sudarsan Ranganathan, Secretary, RCM East, Rtn. Magesh Pattabhiraman, Chairman, Wings to Fly, were present along with other members of RCM East. .
Rtn. K. Ananth, President, RCME said “Justifying the title 'Wings to fly', the 08 winning students will be taken for a visit to places like Berlin and Munich in Germany where the water management is a way ahead than other nations. He stressed that students from corporation schools are no less competitive compared to other institutions, if they are provided with enough opportunities. Winners of the 2nd edition of Wings to Fly – Elocution competition, are seen along with Mr. Helmut Schippert, Director, Goethe-Institut, Rtn. K. Ananth, President, Rtn. Sudarsan Ranganathan, Secretary, Rtn. Magesh Pattabhiraman, RCM East and other fellow Rotarians. Students deliver fiery speeches, during the final round of Wings to Fly Elocution Competition 2017.